Memorial Day Weekend is upon us; and in just a few moments, I will be heading out in the RV with Mrs. Bully and the Little Bully’s to a local lake for the weekend. I will be back in the office bright and early on Tuesday morning. 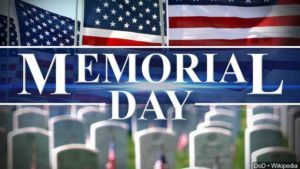 There is always a lot of confusion regarding Veterans Day, Memorial Day, and Armed Services Day here in the U.S.. Memorial Day, is a national day of remembrance of those Service Members we have lost since we became a Nation. So by all means, enjoy the weekend; drink the beer, eat too much; and lounge a lot (I plan to); but please, take a few moments to remember why we mark today on our calendar.